128 Megs of RAM and 30 Megs of free hard disk space. Includes 30 Power Supply Templates from ON Semiconductor. and New User Tutorial 2 (.pdf or .htm) (follow-on to tutorial 1 discusses advanced features included in ICAP/4Windows and higher offerings). - The ICAP/4Windows Demo has a 20 Parts simulation limit. If you place more than 20 parts on the schematic, or place a subcircuit model comprised of more than 20 parts, the software will provide a "too complex" message and will not simulate the design. 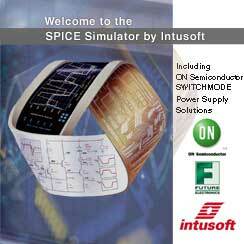 Note: No limitation in the Demo is imposed regarding the addition of your own SPICE3 compatible models. any loop configuration. Its creator, Dr. R. David Middlebrook with California Institute of Technology, also presents a wealth of techniques for successful SPICE simulation. The ICAP/4Windows demo includes GFT Templates and also a User's Manual written by Dr. Middlebrook. - The Scope5 Demo version (IntuScope waveform viewing and processing tool) will not allow you to use a text file of data points as a source. - The Scope5 Demo version will not allow you to read in touchstone files and plot Smith charts. - ICAP/4Windows Demo New User Tutorial Movies help you get started with ICAP/4Windows fast. They make learning basic concepts easy. Now you can learn SPICE the multimedia way! - ICAP/4 documentation includes the IsSpice4 User's Guide, Working with Model Libraries, and the Power Supply Template instruction sheet. The IsSpice4 book contains a complete syntax reference guide to IsSpice4, including data on advanced analyses, model parameters, and Interactive Command Language (ICL) scripts. "Working with Model Libraries" contains information and equations for key IsSpice4 semiconductor models and subcircuits. The Power Supply Template instruction sheet goes through an example circuit to show the value and time-savings of these powerful and ready-to-use power supply designs. Extensive in-application help is included in the software. It walks you through any aspect of the ICAP/4 software and documentation. Hardware requirements: Windows 2000/XP/Vista/7/8/10 and requires 128 Megs of RAM and 30 Megs of free hard disk space. There are many free PCB layout packages. We recommend expressPCB, just export our PADS 2000 netlist and your are ready to go! Two-Port Network Tutorial Examine this step-by-step tutorial on using the ICAP/4 Two-Port application. It covers basic network behavior and simulation of a two-port design, including use of ICAP/4's Library Manager. The tutorial is valid for networks using Y, G, H, Z, S, and T parameters. - This demo comes with fixed Fair-Rite Core Library (Subset of our extensive Fair-Rite Core library. You can not add more cores to this Demo Version. Note: The actual software allows you to easily add any core you want and includes many thousands of cores from different vendors. - This Demo limits you to only 2 windings. Note: The actual software allows you to have 32 windings. - The ability to save is disabled in this Demo. - The ability to produce summary and winding reports is disabled in this Demo. - The SMPS wizard for creating Forward, Push-Pull, and Bridge Buck regulators using the transformer tab is disabled in Demo. Note: The SMPS wizard for creating transformer coupled Flyback designs using the inductor tab is available to show how the SMPS wizards work. Hardware requirements: Windows 2000/XP/Vista/7/8/10, and requires 32 Megs of RAM and 15 Megs hard disk space. 2018© Intusoft, All Rights Reserved.